This installment of 13th Age Monthly clocks in at 10 pages, 1 page front cover, 1 page editorial/SRD, leaving us with 8 pages of content, so let’s take a look! 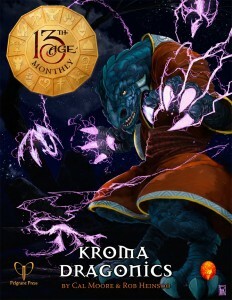 All right, so, personal antipathy aside, there seem to be a lot of players who enjoy playing dragon-people and the variant race introduced back in the day, so here, we actually get chromatic draconics fully depicted – though their moniker, “kroma”, obvious is shorter…and hence the one most widely used. The cool thing in this installment of 13th Age Monthly, at least as far as I’m concerned, is that the race now is no afterthought-option anymore: With evocative 13 things that might be true about them as well as information on inner-racial nomenclature, 5 origin myths (and some advice on weaving them together) as well as some ideas regarding icon influence, kroma draconics end of feel much more rounded, much more organic that before – and that is great in my book. In fact, against my own personal bias against the very notion of draconics, I found myself rather impressed by the campaign seed that essentially suggests a Koru-behemoth-based draconic state – kudos! The additional feat options herein allow for either better breath weapon-progression and limited flight based on the battle and, at champion-tier, the escalation die – pretty interesting means of not allowing for low-level reliable flying, particularly considering that flight eliminates your breath weapon racial power. Tying breath weapon and rage together for barbarians is an interesting combo, while fighter may go for the 1st level tail whip or the 7th level gathering breath maneuver – both of which are solid. A new sorceror talent ties re-use of breath weapon spells to the breath weapon power’s recharge – so yes, some nice, thematically-fitting options here. The book, beyond this, also features one draconic monster-stat per color, running the gamut from 3rd level archer to 7th level wrecker, including two universal draconic nastier specials – providing a well-rounded array of adversaries, all with unique tricks. Editing and formatting are top-notch, I noticed no significant glitches. Layout adheres to 13th Age’s 2-column full-color standard and the pdf provides neat artworks in full color. The pdf has no bookmarks, which is a slight comfort-detriment. Cal Moore and Rob Heinsoo deliver herein. I just can’t deny it. I’ve never made a secret about me not liking most representations of dragon-like humanoids and their impact on the world, with the notable exception of the Mharoti empire in Kobold Press’ Midgard. Apart from that, they always felt wrong and kind of lackluster to me. I really dislike the notion and am not a fan of the very concept. Know what? This pdf is still great. I tried hard to swallow my dislike for the subject matter and ended up not having to do so: What we have here is an inspired little ecology that also doubles as a nice expansion for players. I did not expect to find anything I’d like as a person herein and found aplenty – and if that is not testament to being a worthy addition, what is? My final verdict will clock in at 5 stars + seal of approval. You can get this cool little racial supplement/ecology here on OBS! Want the whole subscription? You can get that here on OBS!